This month North Coast Creations is releasing 2 beautiful scenic stamp sets, a vintage Barn and a lovely Gazebo. These stamps look wonderful on their own, or paired up with sentiments to create beautiful cards, and gift sets. The Barn even makes a beautiful winter scene for a Christmas card! Continue reading below to find out how you can win one of two North Coast Creations $10 Gift Certificates good towards the purchase of NCC Stamps, just for commenting on the Designers cards. I love barn stamps! For this card, I stamped the Barn in Coffee Archival on Vanilla card stock, then die cut the Vanilla panel using the Big Shot and Spellbinders Radiant Rectangles Die. The image is colored with STAEDTLER Karat Aquarell Watercolor pencils. I added the clouds by sponging Blue ink around a scallop edge and the grass by sponging on Green ink. 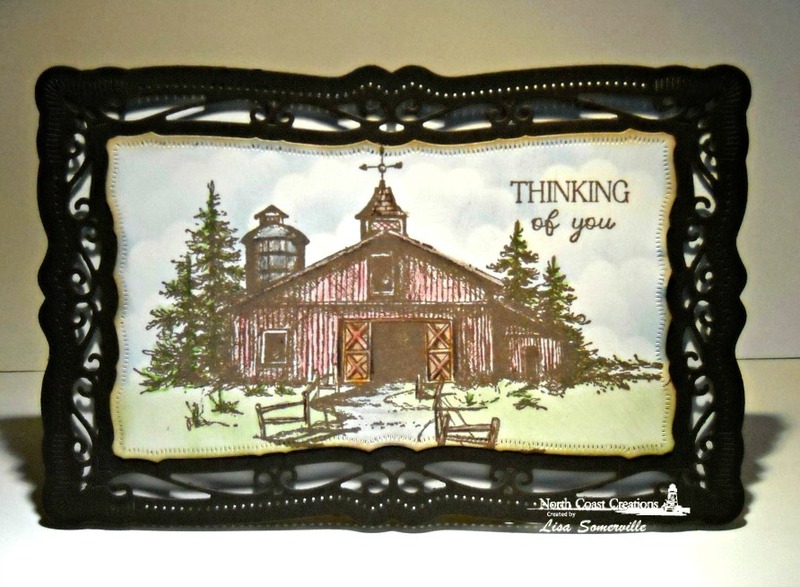 The sentiment is from North Coast Creations Find Beauty stamp set. For the card base, I die cut the largest Radiant Rectangle, holding the cut just above the fold, then die cut additional Radiant Rectangles from Espresso card stock. The frame is added to the base card with dimensionals, the stamped image is adhered in place with a tape runner. You have until Wednesday, July 24th, at 9 pm EDT to leave your comments on the Designers Blogs for a chance to win one of two $10 NCC Stamp Gift Certificates. Winners will be posted July 25th, on the North Coast Creations Blog, so be sure to check back there to see if you are one of the winners! I love how you took such a rustic scene and made it so soft and pretty with the watercolors and the Radiant Rectangle die. This barn scene is quickly becoming one of the tops on my wish list! Great card, I love the frame for this also. 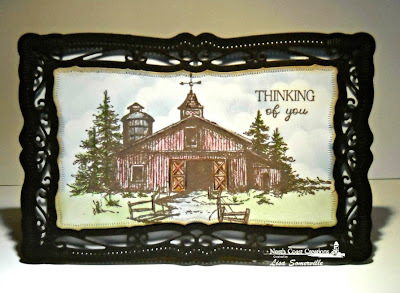 I love old barns and the beautiful die-cut frame and the rustic look make this card great. oooh, I'm with you...love barns! a wonderful sample, Lisa! love how you've framed the image and awesome clouds! Beautiful barn on a fabulous card! The barn is so detailed, love it. Lisa this is stunning!!! Beautiful coloring and I love the SB shaped card!!! The diluted colors and then the black frame for this card make it very striking. WOW, this looks like a picture to frame. Love the way you did this. Wonderful, Lisa! Love the framing around your beautiful old barn. The cloudy sky looks terrific. Beautiful cards and super coloring. This is a beautiful rustic card. Love the colors used. The clouds are so soft and realistic...they make a wonderful backdrop for the rustic barn. Great work! Beautiful, Lisa! I agree...the clouds are amazing! And I love the frame around this beautiful image! Fabulous! Fabulous Lisa! Love the soft clouds and the feel of the rustic barn! Beautiful job on both images! Lovely card & frame!! Spent many years growing up on my uncle's farm for family gatherings!! The frame just made it pop...How nice! Beautiful! I love the vintage feel with the awesome framing and subtle colors. Love it!!!! HUGS!! Beautiful! What a lovely frame to compliment this already gorgeous coloring - great work! Blessings! Hi Lisa, your barn is colored so softly and beautifully framed with the die!! Thanks for your inspiration. What a beautiful card. TFS. very pretty, love the dark framing around the image! Love your card and the way you framed it.